More than 1,000 Union and Confederate generals fought and served during the course of the Civil War. Whether Union or Confederate, each general considered himself an American, and each fought for his ideals and beliefs during America's darkest hour. The generals, moreover, were not immune from death or wounds. 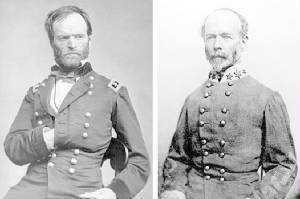 These men, whether Rebel or Yankee, truly led by example and their respective military service records confirm it. North Carolina, for instance, lost nearly 1 in 3 of its generals in killed or wounded, and it was the highest loss for any state in America. In the below list of generals, the following information is provided: biography (some generals include two or more biographies), history, photographs, pictures, historical markers, paintings, monuments, and Union and Confederate compiled military service records (CMSR). (Includes some previously rare non-published material.) In addition, as time permits, the webmaster and editors will be adding previously non-published material, so you are encouraged to bookmark for updates. *About the American Civil War Generals. Photo of General Robert E. Lee and his Confederate generals in their first meeting since the surrender at Appomattox. General Lee and the former Confederates were at White Sulphur Springs, West Virginia, in August 1869, where they met to discuss the orphaned children of the Civil War. This is the only photograph in existence of Lee with his generals. 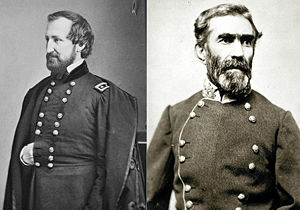 Left to right standing: General James Conner, General Martin Witherspoon Gary, General John B. Magruder, General Robert D. Lilley, General P. G. T. Beauregard, General Alexander Lawton, General Henry A. Wise, General Joseph Lancaster Brent. 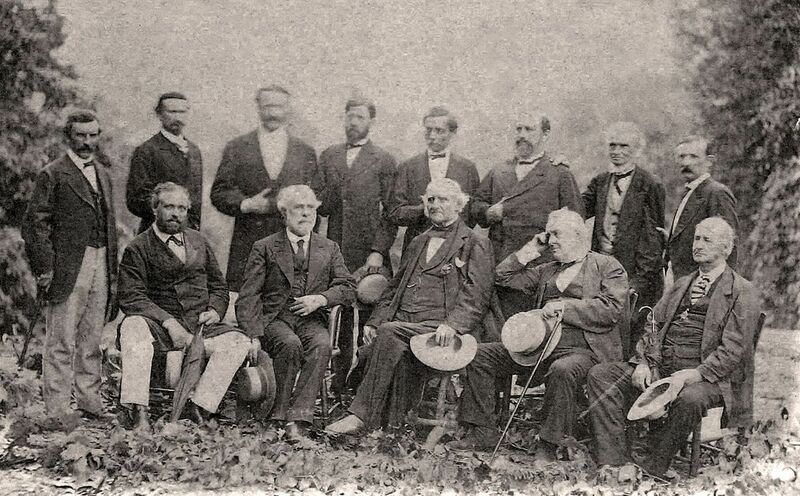 Left to right seated: Blacque Bey (Turkish Minister to the United States), General Robert E. Lee, Philanthropist George Peabody, Philanthropist William Wilson Corcoran, James Lyons (Virginia). The only exhaustive guide to the South’s command, Generals in Gray belongs on the shelf of anyone interested in the Civil War. Each Union and Confederate biography serves as an indispensable reference. RATED 5 STARS! Recommended Reading: Generals in Blue: Lives of the Union Commanders (Hardcover). Description: More than forty years after its original publication, Ezra J. Warner’s Generals in Blue is now available in paperback for the first time. Warner’s classic reference work includes intriguing biographical sketches and a rare collection of photographs of all 583 men who attained the rank of general in the Union Army. Here are the famous West Point graduates and the political appointees; the gifted, the mediocre, and the inexcusably bad; those of impeccable virtue and those who abused their position; the northern-born, the foreign-born, and the southerners who remained loyal to the Union. Recommended Reading: Rebels and Yankees: Commanders of the Civil War (Hardcover), by William C. Davis (Author), Russ A. Pritchard (Author). Description: Davis and Pritchard have created a wonderful work that is sure to become a hit with anyone who studies the Civil War. This book uses words and a generous amount of pictures and photographs to tell the story of the leaders, both talented and flawed, that held together the two struggling armies in a time of chaos and devastating loss. Continued below. Although many of the stories have been told in one form or another.... Commanders compiles this study in a single book that makes it very easy to compare and contrast the styles and techniques employed by officers of both armies. With this book, the reader will have a greater appreciation for both the Yankee and Rebel general and their respective contributions...I thoroughly enjoyed the book and highly recommend it.